As twilight ebbs into darkness, are you peering out into a pitch-black yard? If you don’t want to use a flashlight (or worse, your cell phone) to navigate the yard at night, you need the best outdoor solar lights to guide your way. But which are the best ones, and what sets them ahead of others? 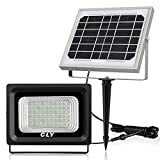 We’ll explore the topic of outdoor solar lights in depth, going over different styles and models to find some of the top choices on the market. You’ll soon know what will be ideal in your entertaining space! These Maggift solar lights offer a decorative lighting solution for your garden. The obvious need for lights in general exists. When the sun goes down, you can’t see a thing out there. But why should you be investing in the best outdoor solar lights, and what will they do for you? First and foremost, they can go in places where normal lights can’t. Wiring a yard is a complex process which involves laying protective pipes, serious waterproofing of wires, and similar mental gymnastics. But with a solar light, you can just pick a sunny place and put a light in it. They can reduce your power bill. If you spend a lot of time in your yard in the evening hours, regular lights are drawing power. Older light fixtures on houses may be drawing an awful lot of power (I’m looking at you, old sodium light on the porch!). Solar lights power themselves. You can establish travel pathways. Solar path lights mark the way, as do solar bricks or pavers. It’ll be easy to find the safest path through the yard at night once these light up at dusk! Deterring large animals and criminals is also a perk which solar lights can offer. Motion-sensing solar lights will only turn on when movement is detected, immediately shining a light through the yard and scaring critters and people away. Finally, you can liven up your nighttime environment. With the vast array of solar light options that are out there, you can decorate with strings of solar lights or place a solar lantern in a prime seating area. There’s plenty of decorative options available! Solar fence lights form pools of light on the lawn. There’s tons of different types of solar lights available, but which are the best outdoor solar lights for your needs? Let’s break them down and see what might be perfect for you. 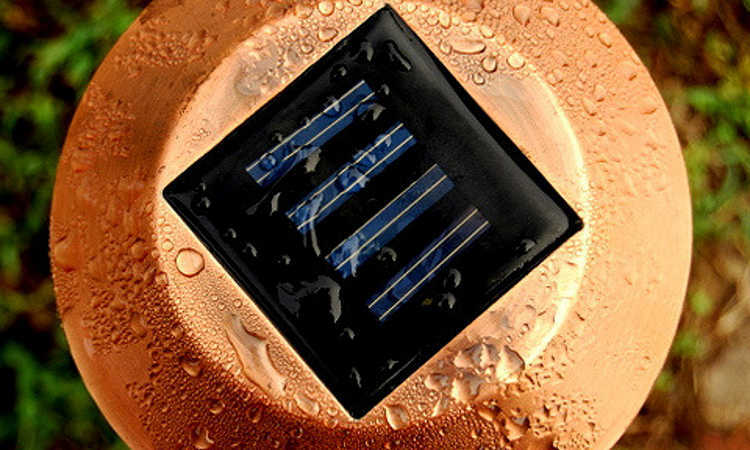 The smallest of the outdoor solar lights are usually used to line the edges of pathways or to provide a small glow in your garden beds. Whether used for decoration or for actual light, these devices create a soft glow that will chase some of the darkness away. Slightly larger than path lights or garden lights, landscape lights are also used to line paths, but can also be used to highlight particular areas of the yard. While these aren’t daylight-bright, they can direct attention to the edges of the pool deck or help you find your storage shed at night. Whether playful in design or plain, a string of lights around one’s deck or gazebo can invigorate the nighttime landscape. Available in multiple colors and even color-changing varieties, these can perk up the patio during your next barbecue party. Need a lot of light? Consider picking up a solar flood light or solar spotlight. Multiple LEDs and good reflectors produce significantly more light than the single-LED lights will, plus you can either illuminate an entire section of the yard or direct a much brighter light at one spot. Don’t want a traditional light-shaped light? Perhaps solar bricks or solar pavers will be good for you. Solar bricks can be placed above ground at different points to light the way. Solar pavers can be inset into your tile or brick patio surface, creating light at the ground level. Are the neighbor’s cats driving you nuts at night, or are you considering adding lights to deter potential home intruders? Motion-sensing solar lights will help. These can go anywhere that receives a lot of daytime sunlight, and will turn themselves on at the first sign of movement. 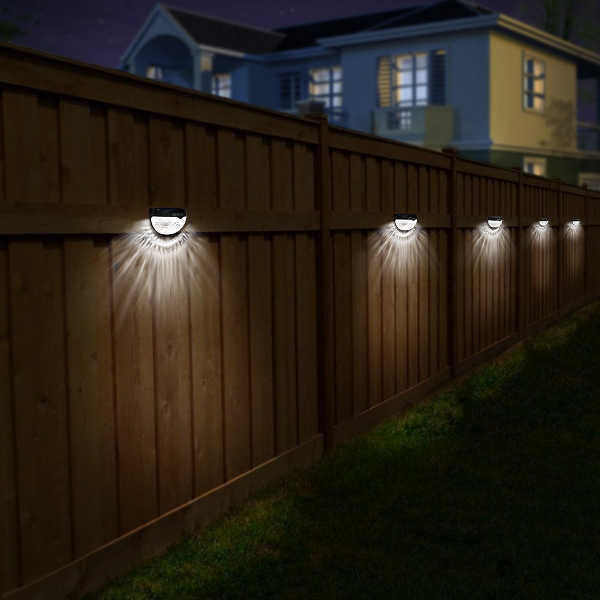 If you’d like a soft glow that can suffuse the entire yard, consider getting a set of fence lights. Once attached to the fence, these will soak in the sun’s rays during the day. At night, they provide a gentle glow which can mark off your yard’s boundaries. Speaking of fences, most have fenceposts. Decks also have posts. Why not top these with a great solar light to provide ambiance in the yard? Many varieties are available to fit multiple sizes of fence or deck posts, and they provide a nice cap right along with the lighting. Many of us go decorative in the yard, and finding the best outdoor solar lights to decorate with is equally important. Whether it’s a lantern-shaped solar light or faux fireflies in a solar mason jar, these little gems can brighten our lives. Solar light maintenance is actually pretty easy on the whole, and is something you should likely do a couple times a year. First, check your solar panels. Whether big or small, they need to be clean and free of dust and debris to properly catch sunlight. If they’re dusty, hose them off to remove loose material, then use a soft-bristled brush and soapy water to clean the panel thoroughly. Rinse, taking care to ensure that no soap scum remains, and dry off completely with a towel. Once your panels are clean, it’s essential to make sure that light is easily hitting them. Prune back growth that may be blocking light to your solar panels, such as excess foliage on trees or overhanging bushes. Check the protective shield around the LED as well and make certain that’s clean, as well as any reflectors inside the light. This will ensure your light is nice and bright. If your solar lights seem to be on for less and less time each night, it may be time to check the battery connection. Less-expensive lights may just be replaced as it’s cheaper to do that, but pricier ones should have the batteries removed and examined for corrosion or damage. Most batteries can develop corrosion over time, but it can generally be removed with a stiff-bristled brush or a piece of sandpaper if you’re careful. Alternately, simply replace the battery with a new one, as most of these batteries are available for purchase. Keep in mind that your batteries will also wear down with regular use. Rechargeable batteries don’t last forever, and store fractionally less with each solar charge. Over time, this really adds up! This is probably the most recognizable style of solar light, as you can find similar lights anywhere. However, VOCOO solar lights have a steel exterior that helps keep them intact for years, unlike the plastic bodies of other inexpensive solar lights. Installing these lights is incredibly easy. Simply pull out the tab that blocks the battery from the rest of the wiring, remove the stake from inside the shaft and turn it around, and press the light into the ground in a sunny place. The solar panel will take it from there. As these are small lights, you’ll want multiple of them to line your pathways. They aren’t glaringly bright, but do provide a good amount of light to see your footing by. Did you want just a little light to add a decorative element to the edge of your garden beds? 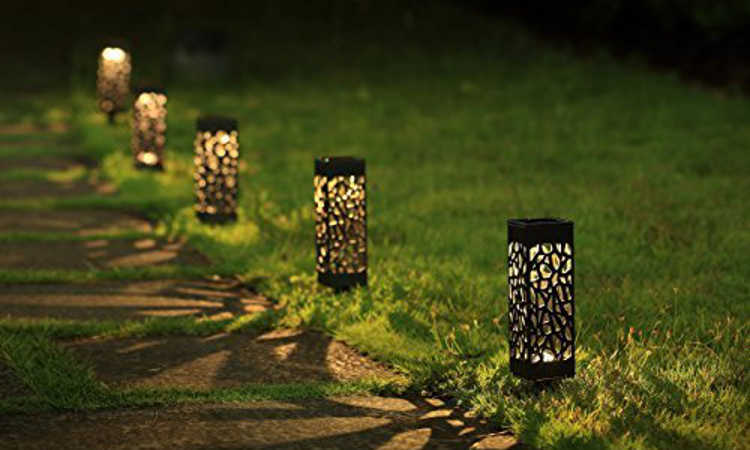 The lacy patterns that these solar powered garden lights create will provide exactly that. While not intended to guide the way, you can incorporate these around small bedding plants for effect. These lights also work extremely well in planters or raised beds, provided that your plants don’t block the sunlight. They can be used year-round, but should be brought indoors if you’re expecting a few inches of snow (mostly because the solar collectors get covered up). While it is by no means the fanciest model of solar light out there, the Payton design of Moonrays solar lights provides double the average light normally available from a path light. However, their size puts them in the range of landscape lights, at 15″ in height and 4.7″ in width. Traditional wired-light shaping lends these landscape lights the look of a permanent fixture, but they’re easily picked up and moved elsewhere when needed. Like the path or garden lights, they are stake lights, and can simply be pressed into the ground where needed. I personally consider this style to be one of the best solar landscape lights choices. 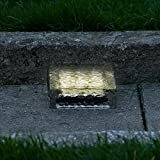 It isn’t flashy, but it blends seamlessly into the landscape of your yard and provides a steady, functional light in the dark hours. 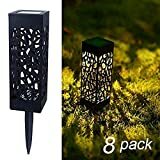 One of the most annoying parts about choosing solar string lights is finding ones which are made for consistent outdoor use. Often, they simply aren’t weatherproofed enough, and moisture can slowly penetrate into the wiring and cause corrosion. Not so with these Brightech solar lights. I consider these to be the best outdoor string lights because they’re extremely durable and weatherproof, plus they provide the perfect lighting for a romantic meal or a relaxing garden party as twilight fades to night. Designed to meet commercial-grade standards, these will last you for years and years. The solar panel can be oriented to where it will gather the most sun, and the lights will automatically flick on at dusk, giving you up to six hours of charming light. LTE has made a solid solar floodlight. Sixty super-bright LEDs are mounted into a die-cast aluminum body that’s been fully weatherproofed. This can be mounted on a wall with its solar panel up to 16 feet away to be in the best position to catch sunlight. Fully charged, this solar flood light can be on continuously for 8-10 hours without any problem. 120 degrees of light provides ample light to see and move around, lighting an area that’s roughly 20 feet by 15 feet with no problem. This is an excellent security light or just a solid night-time solution for yard lighting. 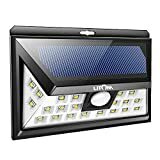 It’s one of the best outdoor solar flood lights you can find on the market right now, and well worth the money spent! 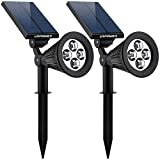 I’ve got a pair of these URPOWER solar lights as backup lighting for my front porch, and they work extremely well. They can be wall-mounted or stake-mounted depending on your needs, and as long as the panel has full exposure to sun, they’re wonderful! Two modes, high or low, allow you to determine how much light these produce. High mode will run through the battery power quicker, but if you only need light for a few hours it’s perfect. Low mode will provide soft light from sunset to sunrise. The solar panel is adjustable in a 180-degree range to angle it towards the sun. However, be aware that the light remains in line with your solar panel, so you’ll need to plan your positioning to provide the most light to the solar collector during daylight hours. I just love the concept of having a glowing brick settled on the edge of a raised bed or tucked along the side of a garden path at night. The LampLust solar bricks provide either a warm or cool white ambient light as well as decoration that blends in during sunlit hours. It’s important that you do not try to set a solar brick into a pathway, as these are not meant to be built into place like a paver might be. Submerging it in water may damage the internal wires inside the glass body. But when placed above soil level in a dry location, these can be outdoors rain or shine. Keep the exterior glass cleaned off to allow for optimal solar charging, and they’ll illuminate your yard all night long! Looking for a recessed solar light to edge your driveway or inset into the gravel between paving stones? 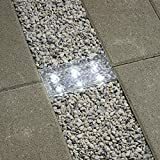 Look no further, because LampLust also makes a solar paver which is designed to be recessed and flush with the ground! Creative placement of these solar pavers will allow you to add ambient ground-level lighting exactly where you need it most. The resin keeps moisture out of the wired elements inside the light box, and cool and warm light options are both available. In areas where you have full sun during the daylight hours, a few of these will ensure you don’t have to spend another dime on power to light your way. 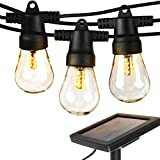 I definitely consider these to be among the best outdoor solar lights options available right now. Three different modes are available with this Litom solar light: one consistant, always-on option and two motion sensing options. 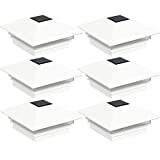 In one of the motion sensor choices, you can opt for a low-level constant light from dusk to dawn, and when the sensor’s engaged it’ll turn to high-powered bright lighting. The other choice keeps it off until the sensor triggers, at which point it goes blindingly bright. While the one I’m covering is the 24-LED version, there is also a 40-LED version available that will provide even more light. Having it suddenly flick on in the dead of night will scare away most wild animals and unwelcome guests, keeping your property safe and secure. 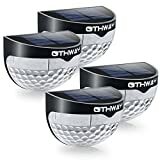 If you’ve got a nice fence, why not show it off at night with a set of these OTHWAY solar fence lights? These half-round lights create a sunburst of lighting that will bounce off the fence and provide a nice, ambient glow. These are great accent lights, plus when combined with other solar options you can provide plenty of electricity-free lighting for your yard. They can be great for security purposes as well, helping ensure that unsavory sorts stay off your property. Best of all, if mounted out of the reach of little kid fingers, you don’t have to worry about your children wandering off with them – and as anyone who’s ever tried to keep a toddler in check knows, that can be an incredibly good thing. Anyone with a ranch-style post fence or deck railing will love these low-profile solar lights. Designed to cap off a 4×4 fence post or deck railing, they slide right into place and then start soaking in the sun’s rays. At night, soft light spills out from the sides of the cap. A wired deck railing costs a small fortune to install, but these are comparatively only pennies and require only a screwdriver to secure in place. With these, you can have a warm, ambient glow along your railing or fenceline through the night. Please note that these do not fit PVC posts — they’re designed for wood posts only! I freely admit that these are a little bit silly, but they illustrate the point of decorative lights incredibly well. 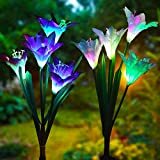 Anyone who’s wished they could see their prized plants more readily at night will enjoy these whimsical, lily-shaped solar lights. Built-in LEDs hidden in the center of each flower shape will slowly change colors in the dark hours, and your flowers will appear to magically glow from deep within. When tucked amongst shorter bedding plants, these will spark a bit of life all through the night! I know there’s a whole lot of solar light options out there, and I’ve barely scratched the surface. 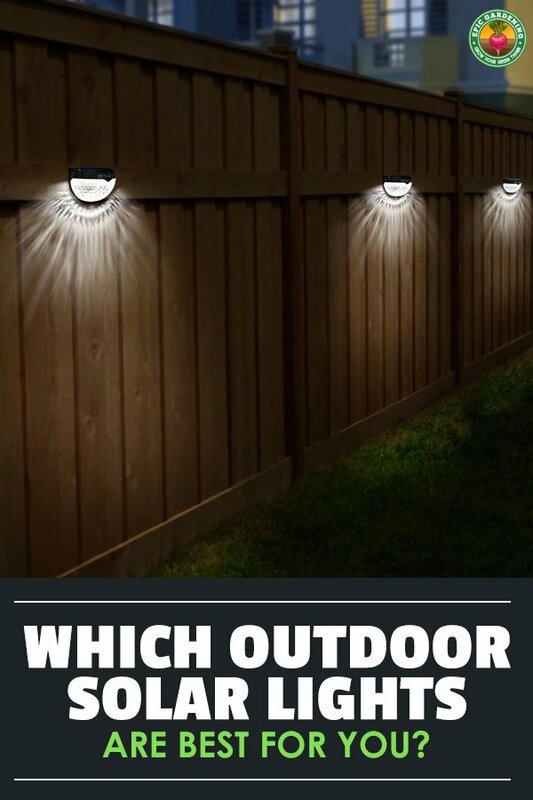 But I consider all of the above to be among the best outdoor solar lights you can find. Do you have other lights you use to illuminate your evening? Tell us all about them in the comments!